So everyone knows that we review burgers (at least we hope that is apparent by now) but burgers are not the only thing we eat. We frequent a lot of other food joints around the Queen City and one of our favorites is JJ’s Red Hots. 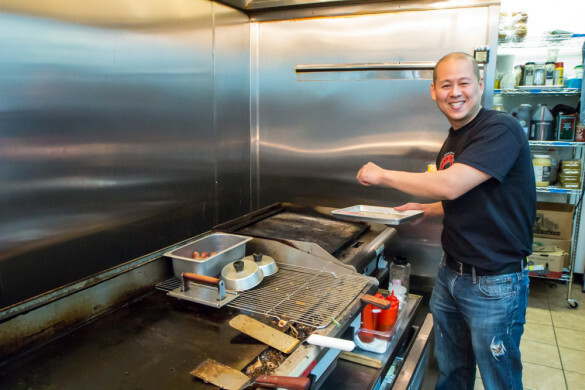 JJ’s is a hotdog joint that brings great dogs and sausages, pairs them with amazing toppings, and a brand that is rooted in timeless values like hard work and friendly service. We were lucky enough to be able to partner with JJ’s to bring them a burger themed Dog of the Week and we took this opportunity to talk with their Food and Beverage Director, Jeremy Guthrie. 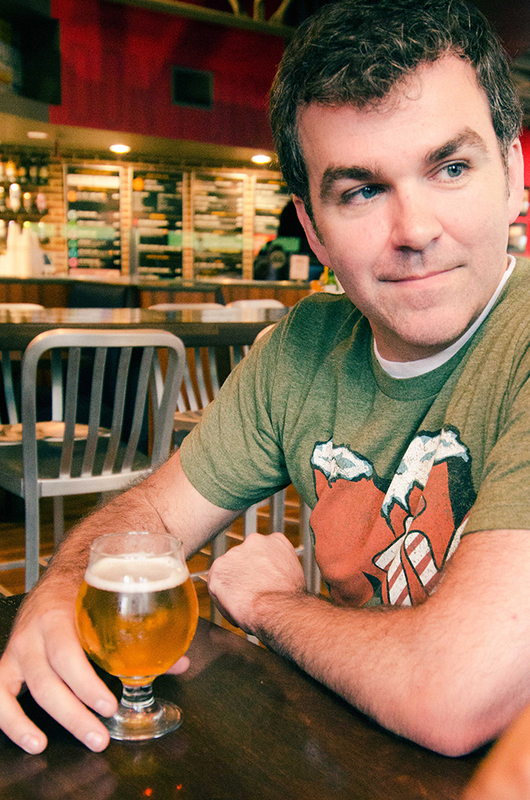 Charlotte Burger Blog: Thanks for speaking with us Jeremy. Can you tell us a little about yourself? Jeremy Guthrie: Well, I’m the Food and Beverage Director here [at JJ’s Red Hots], which basically means that I come up with all the recipes, and hopefully make sure we can make money selling them. That’s kind of important in this business. I do everything from staffing, making schedules, coming up with recipes, and planning the menu for food and beverages. I also have a small hand in events—catering and stuff like that, but that’s primarily Brandy [Newton]. That’s pretty much it. Charlotte Burger Blog: How do you get to be a Food and Beverage Director? Jeremy Guthrie: It’s all in who you know. That, and a Culinary degree. I actually did go to Johnson & Wales, which landed me a job down in the Arboretum area where I met Jon Luther, the owner here. For years he kept saying that one day we’d work together. He opened his own place and brought me on board, so here I am. 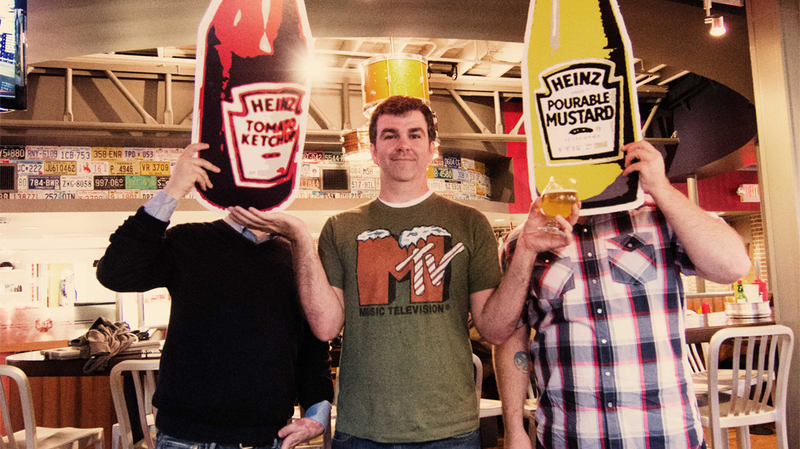 Charlotte Burger Blog: So how did you guys develop the idea of a hot dog place? Jeremy Guthrie: It was Jon Luther’s idea. It’s inspired heavily by a place called Ted’s in Buffalo where he went as a kid. He always enjoyed going there with his Dad. He couldn’t find a place like that here. I want to say he had a bad hot dog experience somewhere, and he was like, “I can make better hot dogs than this,” so he started putting pen to paper and here we are. We’re almost a year in. 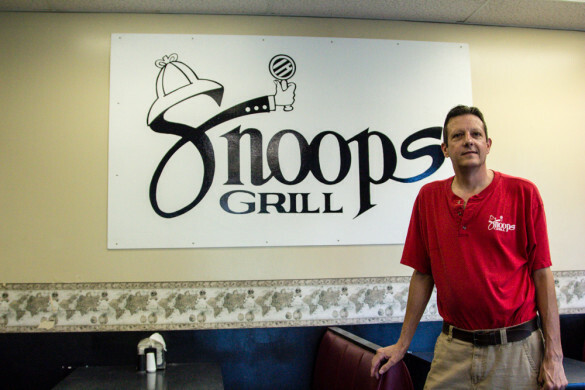 Charlotte Burger Blog: Isn’t the company that makes the dogs out of Buffalo? Jeremy: Yeah. We get our dogs from Sahlen’s out of Buffalo and we also use Weber’s Mustard out of Buffalo, which is where Jon Luther’s from. Yeah, it’s a little bit of his home town down here. Sahlen’s has been a great partner for us to work with. They actually have hooked us up with a good deal on a cart, so you’ll see us around town real soon. We’ve dubbed it “Frank the Tank.” Once it hits your lips, it’s so good. We’ve been doing off-site things, but we’ve been using Sahlen’ts cart, so now we’ll have our own. You’ll see us at Little League games, at breweries. Wherever Brandy puts us. Charlotte Burger Blog: Where did you guys figure out the branding here at JJ’s? It’s very impressive. Jeremy: Matt Stevens, a local independent designer, and Jon Luther worked on that. Jon gave him ideas of what he wanted, and Matt kind of came up with the feel, the textures, the entire design as far as I know. He just won Best in Show at the Addy’s, so we’re pretty happy with Matt. We’ll probably keep him around. Why not? 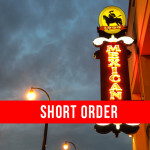 Charlotte Burger Blog: Talk to us about the menu. Is there particular items you want to highlight? Jeremy: As far as hot dogs, the Char-Heel our best selling dog, it’s our classic Carolina style—chili, slaw, mustard, onions, that type of deal. We do make sausages in-house as well. That’s a big thing. A lot of people will say we’re just hot dogs, but we’re not. We are also other encased meats. We make bratwurst, andouille, and a salmon sausage in-house. The thing I’m probably most excited about are these wonderful Dogs of the Week. It keeps it fun and excited and something new every week. Charlotte Burger Blog: Well, we should take this opportunity to thank you for giving us the chance to have a Dog of the Week ourselves. 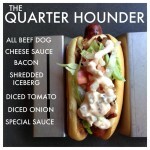 [It is a burger themed hotdog called the Quarter Hounder, available the week of May 6th, get yours now!] We think that’s amazing. No burger place has asked us to do that yet. How did that all start? Jeremy: It really kind of started as we tried to get community involvement. We wanted to hook up with people who could help us promote, instead of us always saying “hey, come try this, come try this.” It’s a another few avenues there. 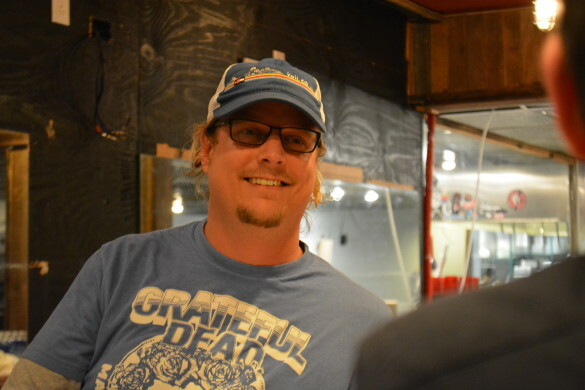 I know a lot of people in the beer industry in town, so we started there, asking brewers and brewery reps, and Daniel Hartis, who you guys know. They’ve been great sellers for us. Part of that is the cross-promotion. Charlotte Burger Blog: Tell us what you have in store for JJ’s Red Hots, I know you guys are opening a new location. Jeremy: Yeah, our second location is going to be awesome. It’s in Ballantyne, it’s in a space that was last occupied by Creole’s. It will have a bar, with eight taps. We’re probably looking at maybe July 4th again. We were discussing today a possible one year anniversary here [at the East Blvd location] and a grand opening there on the same day. It falls on a Thursday, so we’ll see. We also just did a big renovation on our rooftop deck. We’ll have a bar up there with four drafts. There’s a new railing and ledge up there with stools on it. Charlotte Burger Blog: That’s really cool. We hope for the best with the new location and we will definitely check it out. We would like to thank Jeremy Guthrie for speaking with us and Brandy Newton (JJ’s Event & Promotions Director) for these amazing photographs and making this all possible. Make sure you check our Dog of the Week, the Quarter Hounder, this week and let us know what you think!